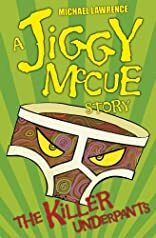 The underpants from hell-that's what Jiggy calls his nemesis in his first wacky adenture, and not just because they look gross Jiggy McCue has a problem. His new underpants won't come off. Worse still, they have a mind of their own-an evil mind that seems to want to ruin his life. And they're succeeding!